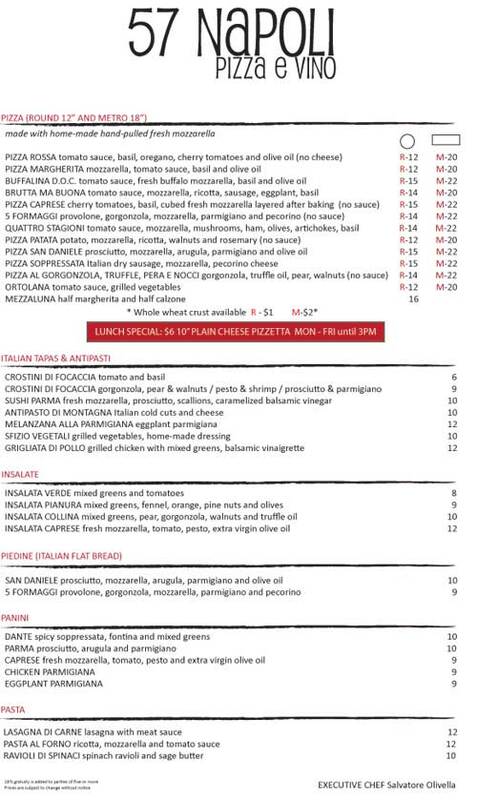 57 Napoli Pizza Adds $6 Lunch Special! Check out the full (revised) lunch menu after the jump. Midtown Gets a Pizza “Speakeasy”? Posted by The ML Team at 3:00 pm, March 23rd, 2010 under 57 Napoli Pizza e Vino. Hmmm..the special is for a “pizzetta”, which somehow sounds like something less than “pizza”. It’s a 10″ personal pie. Not bad for $6. I’d be down if I’m lunching around there.